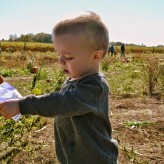 Home » Posts Tagged "teaching children farming"
Getting children involved in farming and home gardening projects can help them connect with nature while exposing them to some fresh air. It also gives them the opportunity to help their parents with gardening. It’s a great way to engage kids in outdoor activities where they can produce food and get exercise all while having some fun. All natural farming or organic farming doesn’t use any toxic chemicals or elements that are harmful to the environment or to humans.